Being at the forefront of professional office and commercial removals is not an easy achievement, but we have invested a great deal of effort, expertise, time and resources to be where we are now. It might not seem like much from the side, but delivering consistently good results, and providing each customer with highly efficient, yet cost effective office removal solutions is serious work, and we know what it takes to make it happen. When you are looking for the best office removals in Belgravia, don’t waste time and effort in sifting through tons of service offers, and don’t get involved in a Ping-Pong game of phone calls and email quotes as this will only leave you more frustrated and roll you back to square one. The solution to your office removal requirements lies with us, and we strongly urge you to come straight to us, as we have the right type of service at the right price. The way we do business is rather simple and straightforward, there are no hidden fees or additional charges burdening our service quotes. Customers who have used our professional office removal services before will know that good things do come at a price, but that doesn’t have to be a ridiculous price. We give you a promise, and a genuine assurance of safe handling and damage-free transportation of your expensive office equipment and furniture, as after all we are professional office and commercial movers and should count for something. We don’t hide behind tons of service terms and conditions, and don’t like overcomplicating our service provision. And why is that? Because customers need actual work done, not just empty promises and words which cost a pretty penny and leave them with a damage tally to cover, or stranded halfway through the removal. In order to make sure that you get the best treatment during your office removal in SW1 Belgravia with us, we have gathered a team of responsible and very efficient professional movers who carry out the tasks they are assigned to with precision and very responsible attitude. Our specialists have access to state of the art equipment and impeccably maintained vehicles that guarantee the safe and sound transportation of your equipment, furniture and other assets. We will deal with all aspects of the office relocation with professional pace and efficiency. Our logistics experts and professional mover teams will get the job done right, within the shortest time possible and with no risk of damage or neglect. Remember – top quality office removals in Belgravia are our specialty! 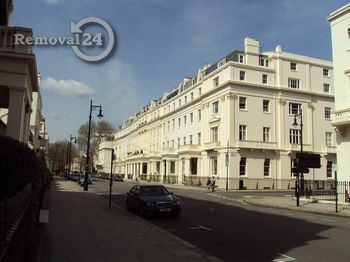 Belgravia SW1 happens to be one of the most exclusive areas in Central London. Part of the SW1 postal district in Westminster, it is reputed for containing some of the most expensive residential properties in the world. The locality is also known for its very beautiful streets and garden squares, among which Belgravia Square, Eaton Square and Upper Belgravia Street definitely stand out with their grand neo-classical architecture and unmatched atmosphere.